The T12 is small and portable given the long list of features. 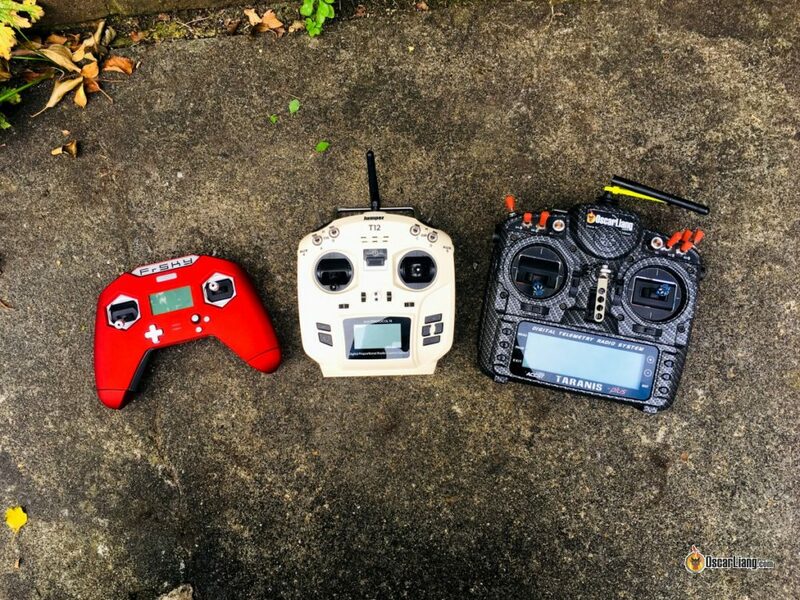 Imagine flying all your quads with just one radio! The price is very appealing too at $83, which is considerably cheaper than the QX7 and X-Lite. But is it a better alternative though? let’s find out in this review. Update (25 March 2019): Jumper released a much better upgrade, the Jumper T16! I think it’s a better radio than the T12, if you prefer bigger form factor. Learn about the basics of radio transmitter for mini quad. There is a “plus version” (http://bit.ly/2RqYruT) that comes with hall sensor gimbals which offer more precise control and longer durability (the rest of the spec look identical). What’s Special about the Jumper T12? 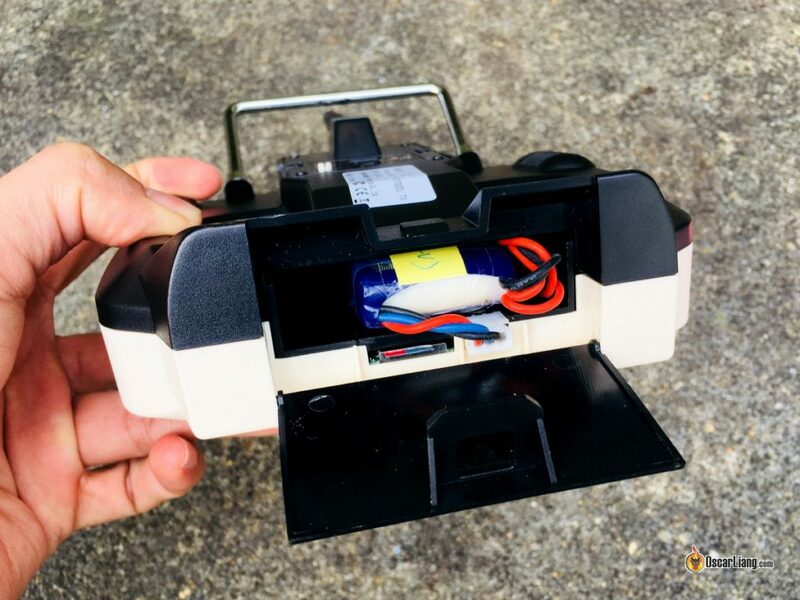 Jumper is known for making great little budget radios. They got my attention when they released the “T8SG V2”, a budget radio that offers multi-protocol support. But it runs Deviation firmware so I wasn’t really interested until they released the T12, which is basically a step-up of the T8SG V2 that runs OpenTX. The main selling points of the T12 are probably the convenience and cost-effectiveness. It supports multi-protocol as well as the Crossfire module which would allow me to control all my quads with just one radio (including toy grade quadcopters). You are not going to feel unfamiliar flying with different radios again. Inside the box we can find the transmitter itself, the manual, a mini USB cable, a neck strap, and a little bag of accessories for the gimbals (screws, springs etc). The T12 features a creamy white plastic case with black accent. The plastic has a slightly matte finish and seems to be of decent quality. The gimbals are quite smooth, and a bit “loose” (not having a lot of tension) out of the box. It’s not a bad thing, but I personally prefer tighter gimbals. You can adjust the spring tension by opening the radio. The stick travel/throw is between the QX7 and X-Lite. The switches have a similar quality to the Taranis QX7. There are 4 three-position switches and 2 two-position switches on the top. That should be more than enough for quadcopter flying. There are also two sliders on the sides. Further Reading: How to setup switches in OpenTX? Unfortunately, one of the switches (SD) on my unit seems to be faulty. It’s a 3-position switch but the “middle position” doesn’t seem to work and is giving me “up position” value. Not a huge problem, the radio is still fully functional but that suggests quality control might be lacking. The power button is right in the middle and well away from other stuff so shouldn’t be easily triggered by accident. To turn the radio on or off you just need to hold down the button for a few seconds, pretty much like the QX7 and X-Lite. The T12 has an RF module bay that supports JR modules without any modification such as the Crossfire. I tested the Crossfire Micro TX with the Nano receiver on the bench briefly and all seem to work as expected. Further Reading: What is Crossfire? To my surprise, the T12 doesn’t have a built-in RF module like other transmitters. The RF module comes in the form of an external JR module (JP4in1 module) that you install in the module bay. There is a mini USB port on the RF module for upgrading the firmware. Unlike its predecessors which all use Deviation firmware, the T12 uses OpenTX. Oh well, not quite, it’s actually JumperTX, which is a fork (modified version) of OpenTX. So you can do pretty much everything in OpenTX with the Jumper T12, including LUA scripts. One of the reasons it needs to have its own custom firmware is to support the different protocols. When setting up a new module, you have to select which protocol you want to use first. This is really the main difference compared to other radios running OpenTX. For toy quads, it can take some time finding the desired protocol as there are so many similar options. For well known ones like Frsky, Flysky and Spektrum it’s pretty easy though. Once that’s done and bound to the RX, everything is going to be just like the X9D or QX7. One issue I found is that I couldn’t choose “Ch1 to Ch8” as the channel range for the Frsky protocol, it’s defaulted to “Ch1 to Ch16”. It could be a bug or limitation due to the “External module” selection in OpenTX, because I could do so with “Internal Module”. Sometimes it’s beneficial to use Ch1 to Ch8 as oppose to Ch1 to Ch16. The SD card slot is located inside the battery compartment. It doesn’t come with an SD card so you would have to get your own: https://amzn.to/2DVblyJ. The SD card is used to store sound files, LUA scripts and firmware files etc. There is no battery included in the T12. 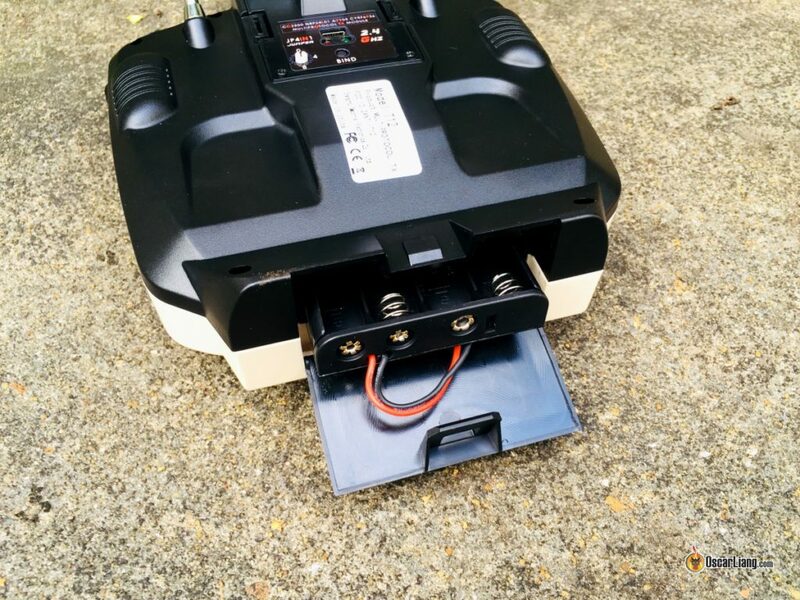 It comes with an AA battery tray (4x AA), and it can also be powered by a 2S LiPo, 18600 or LiFe through the balance connector. Note that it doesn’t have internal charging circuit so you’d have to remove the batteries for charging. I’ve been running a little 2S 1000mah battery (https://amzn.to/2Njf4p5), but you can likely fit a larger pack inside if you can find the right size. There’s a trainer port and USB port on the top side of the radio. You can play FPV simulators by connecting the radio to your computer via the USB port. I tested with Liftoff and it was plug and play, no setup required on the PC or TX. The display works well under most circumstances and the text is readable and clear. The only issue is viewing it under direct sunlight because the back-light is not very bright nor dispersed evenly. I haven’t tested the range thoroughly yet, but I tried flying in my park with a Frsky R-XSR receiver. I was able to fly about 300m away (that’s how big the park is) without losing signal or having any sort of warning, and I think I could probably go further. So I think the range is comparable to most budget 2.4GHz radios (at least). The Taranis QX7 has been my go-to radio for beginners, but now I think we might have an alternative! It’s compact and portable, it supports a lot of protocols, and it runs “OpenTX” even supports Crossfire! Did I mention it’s also a lot cheaper than the QX7? I wish the shell was made bigger and more ergonomic, it feels too small for a solid grip on the radio for pinchers, but fine for thumbers. The switches are a bit too close to the gimbals, for pinchers it’s possible to knock them by accident. I also wish there was at least one momentary switch for things like “Pre Arm” (two stage arming). Is the “Plus” Version Worth It? The price difference is $27 and all you get is the Hall Sensor Gimbals (and black shell). Yes, those upgraded gimbals are nice, but it’s not worth $27 in my opinion. If you want those gimbals, it probably means you want more precision in your control, then you might as well getting a better radio with full size gimbals, like the Nirvana or QX7-S, these radios both come with Hall Gimbals. The bigger gimbals give you longer stick travel and “higher resolution” for smoother control. I’m trying to bind the R9M module installed on my T12 but it does not work at all.. If I select “Bnd” command it does not blink or sound at all. Does anyone know how to get it to capitalize letters when doing text input? I cant for the life of me figure out how to and its not deal breaking its just annoying as hell. I had the same issue and was able to resolve it by flashing the 2.2.3 firmware which can be downloaded from the jumper.xyz website. My TX already came with a 2.2.3 firmware, but the date was 16.10.2018, whereas it is now 30.01.2019 (if I remembee correctly). Now I can capitalize by long pressing enter. for the XK k110 helicopter and can find a nice throttle curve in there but in no place can I find a pitch curve. At least with an Open Deviation Jumper T8Sg Plus v2 I was able to find the curves and start to diddle with it within a week of study and got things satisfactory quickly. I am a stark neophyte here too who last flew in the early 1990’s on all analog stuff. Big disappointment to me and no Open Tx group to join where I can bounce this off people much smarter than me. Has anybody figured out how to get Betaflight Lua Scripts working on the T12? The normal technique just yields no values, an out of memory error or syntax error. Running Jumper ver 2.2.2 of OpenTX from 07-31-2018. Just read that the OpenTX team will NOT be supporting it because of it being a knock off. Their ‘official’ stance to date. They even ask that marketing material be changed to reflect the non support. Could I use it in trainer mode with my Taranis X9D please ? I’m looking to buy a cheaper Tx for my children, to use it in trainer mode with myself as master with my X9D. My money would still go on the QX7. I heard this is not fully supported by open tx. Is that still true.